(Toronto, ON - August 19, 2014) In Popular Problems, his thrilling new studio album, Leonard Cohen gets down into the avenues of our dreams and sets a new tone and speed of hope and despair, grief and joy. Cohen here is an astonished lover rocking to the human condition as "the soul unfolds in the chambers of its longing." His legendary basso resonates as never before with a presence and urgency that arises from the very depths of the heart. The clarity and strength of these nine hypnotic songs will have us singing them over and over. Popular Problems is Cohen's 13th studio album, and will be released on September 23rd, two days after his 80th birthday. Popular Problems is available for pre-order everywhere today. Those who pre-order Popular Problems digitally (http://smarturl.it/PopularProblems) will receive an instant download of his new song, “Almost Like The Blues.” Click here to listen. To celebrate his milestone 80th birthday (September 21), Cohen’s endless poetic energy and legacy can be revisited with a new artist page on iTunes (http://www.itunes.com/leonardcohen), which features Popular Problems and includes all 12 prior studio albums Mastered For iTunes. His explorations of spiritual, interpersonal, romantic and political themes have impacted countless contemporary recording artists and writers. He has sold over 23 million albums, worldwide and published 12 books, the most recent of which was 2006's 'Book of Longing', a collection of poetry, prose and drawings, which reached #1 on the Top 10 Hardcover Fiction Books in Canada. Cohen's influence on musical and theatrical artists the world over is inestimable. In fact, when Cohen was inducted into the Rock & Roll Hall Of Fame in March 2008, the revered Lou Reed singled out Leonard as one of the "highest and most influential echelon of songwriters." Cohen's songbook has been covered by hundreds of recording artists including Jeff Buckley, Bob Dylan, Nina Simone, Johnny Cash, Lou Reed, Tori Amos, Nick Cave, Joan Baez, Harry Belafonte, Rufus Wainwright and the Civil Wars. Tribute albums have been released in Cohen's honor in France, Norway, Canada, Spain, Sweden, The Czech Republic, South Africa and the United States. In 2008 Cohen's "Hallelujah" became the fastest-selling digital single in European history when three separate versions of the song appeared simultaneously on the UK singles chart - Cohen's own original recording, a version from Jeff Buckley and another from X Factor winner Alexandra Burke. Additionally, Leonard's songs have been frequently selected to illustrate the emotion of motion pictures and television programs and have been heard in Watchmen, The Passion of The Christ, Natural Born Killers, The Wonder Boys, Pump Up The Volume, Secretary, The West Wing, The O.C. and many others. Leonard Cohen has been honored as a Grammy Lifetime Achievement Award Recipient (2010), inducted into the Rock & Roll Hall Of Fame (2008), the Canadian Music Hall Of Fame (2006), the Canadian Songwriters Hall of Fame (2006) and the Songwriters Hall Of Fame (2010). He has received the prestigious Principe de Asturias Prize – the highest literary award in Spain (Spain, 2011) as well as the Glenn Gould Prize, awarded to an individual for a unique lifetime contribution that has enriched the human condition through the arts (Canada, 2011). The Canadian native has earned his country's highest civilian honors - Officer of the Order of Canada (1991), Companion to the Order of Canada (2003), Grand Officer of the National Order of Quebec (2008). Cohen's recent return to live performance was met with extraordinary and unanimous accolades as he performed around the world from 2008 through 2013. Cohen's mesmerizing recent performances, deemed "a spiritual experience" by all accounts, totaled 470 shows in 31 countries attended by four million fans. Born in Chains is in! Sony missed a number of countries when they listed all the tribute albums for the press release above! I know of two more, due in September - one in Denmark and one in Germany. More later! Sounds great and I can't wait. But why does he have to do this to us with the album covers? I heard almost like the blues this morning. Does anyone know why Sharon Robinson isn't a co-writer of this project? I mean, was there any particular reason that her involvement with this album (if there is any) is considerably limited compared to Leonard's last few releases? Speaking of who is involved, does anyone have a list of names for who is performing on Popular Problems? What's wrong with the cover? I personally like it. Will there be sound clips or previews of the rest of the album released over the coming weeks, or will we be waiting with bated breath?? song being such a wise, experienced man and gifted poet. I love his many metaphors and symbols as well as analysing and "decipher"
them to finally get to all layers of his poems/lyrics. 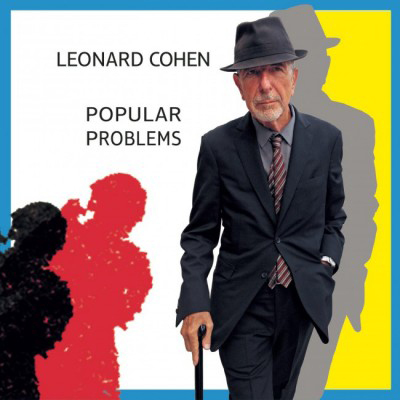 Already on September 23 will premiere new album of Leonard Cohen - "Popular Problems". With the launch of the Polish fans will be able to buy the first edition disc Empik and empik.com with a special booklet containing Polish translations of all the songs from the album. Mr.Cohen the translation process overseen himself, as evidenced by the special autograph artist placed in the booklet. On Face Book everyone was given an opportunity to listen to Leonard's complete CD. The piece provided along with it, written by Ann Powers, was exceptional. Popular Problems may be short compared many of Leonard's other CD's, but the power of his words by far makes up for that. Each time you listen to it you learn more about Leonard and more about yourself. My pre-ordered CD is to arrive in US on Sept 23rd. Can't wait! The power and the passion of his songs is just mind blowing! Oh! NICE press release from Poland! Yes, too... the tortoise and the hare seems an adequate analogy from where I sit for Leonard's stunning success at this stage of his life.